Mukhrino Field Station is representative for pristine peatland ecosystems of the West Siberian plain in the middle taiga zone. 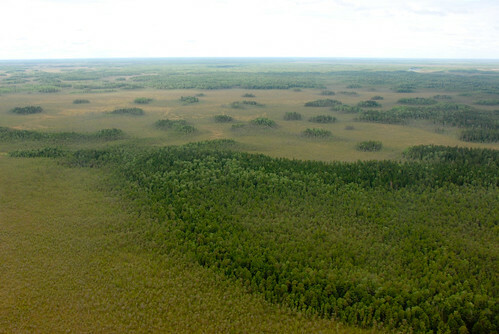 These peatlands cover about 60 % of the land surface of this zone. The peatland complex is a net sink of atmospheric CO₂, as it actively accumulates organic carbon (peat). One of research goals of MFS is long-term climatic observations which would allow monitoring of climate change and assist to other research projects at the station. Further details on the structure of the meteostation and the database please find on a separate page. Mukhrino Field Station helps to fulfill the Biological specimens Collection of Yugra State University which is currently stores about 7000 voucher specimens of fungi, mosses, vascular plants and others. Initially this was the subject of my PhD and it continues to be in the area of interests. 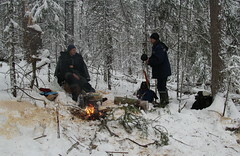 The community of macromycetes (its composition, quantitative structure and phenology) was studied in two bogs near Khanty-Mansiysk as well as in several expeditions in the region. 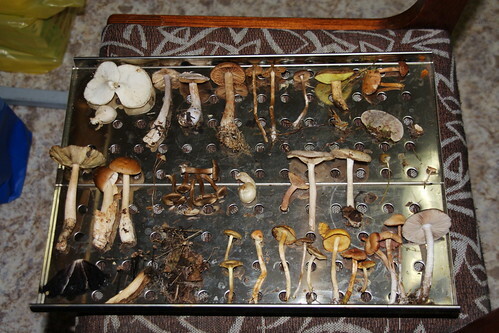 Also a series of observations of bog plant litters were initiated in Mukhrino field station with regular observations of the substrates, collection and identification of fungi and description of their communities qualitative and quantitative structures. Several interesting and expectidly new species of discomycetes were discovered during the project with one species being newly described in a publication. The diversity of wood decomposing corticioid and aphyllophoroid fungi of bog pines was studied a little. The work in this area of interests is continues in regular observations of plots located along the boardwalk of MFS for counting macrofungi. The interesting collections of discomycetes are worked out from taxonomic perspective with great help of the specialists in these groups. The diversity of wood decomposing species is also under next round of identification. 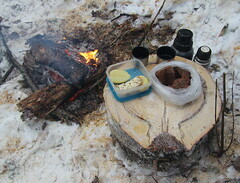 And recently we aided another community of fungi of raised bogs: i.e. corticolous myxomycetes (the substrates were collected and currently processed in Novosibirsk). Still it is rather isolated works on the fungal community of raised bogs touched from different perspectives. I hope to initiate some uniting research project in the future with metagenomics analyses in addition to classical ways of studying the diversity. Decomposition is part of the nutrient cycle and its rate determines carbon balance of a particular ecosystem. Being an important part of biogeocoenological studies, decomposition rate is commonly studied in monitoring programs of field stations. 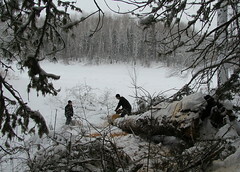 The focus of our research was to estimate the decomposition rates in major ecosystems types in middle taiga zone of Western Siberia. For this purpose, the classical approach of litter bags was used, including standard litter type (tea) and native litters in natural as well as in experimental conditions (temperature raise).